Harpier cries, 'Tis time, 'tis time. According to folklore, witches were believed to have devil spirits, or familiars, as companions who took the form of animals. The first one is a cat, the second is a hedgehog (or hedge-pig), and the third is a harpy ("Harpier"), a monster from Greek mythology with the face of a woman and the body of a bird. Three times the striped cat has meowed. Three times and once more the porcupine has whined. Harpier, my familiar, cries out, “It’s time, it’s time”. Around the cauldron we go, and throw in poisoned entrails. A toad, captured while sleeping, that sweat venom under a cold stone for thirty-one days. It’s first to be boiled in the magic pot. Here’s the slice of a swamp snake to boil and bake in the cauldron. Add a newt’s eye, a frog’s toe, some bat’s hair, and a dog’s tongue, a viper’s forked tongue, a snake’s stinger, a lizard's leg and baby owl’s wing. For a spell of powerful evil, boil and bubble like a soup from Hell. A dragon’s scale, a wolf’s tooth, a witches' mummy, the stomach of a gutted shark, a hemlock root dug up at night when it’s the most poisonous. The liver of a blasphemous Jew, the bile of a goat, slivers from a yew tree cute during a lunar eclipse, a Turk’s nose, a Tartar’s lips. Add the finger of a baby strangled by her whore mother after being delivered in a ditch - all these should make the potion thick and dense. Add in a tiger's intestines, and that’s it for the ingredients in our pot. And every one shall share i' the gains. Cool it with baboon’s blood, then the magic spell is fixed and ready. Oh well done! I approve of your labor, and everyone will share in the rewards. Now dance around the cauldron and sing, like elves and fairies in a ring, to enchant what’s in the pot. I can feel a tingling in my thumbs, which must mean something wicked is coming this way. Open, locked doors, to whoever knocks! How now, you secret, black, and midnight hags. "A deed without a name"
Here, the witches reference historical religious beliefs. When someone was baptized, they were officially given a name and sanctioned by God. By referring to their actions as “a deed without a name,” they are suggesting that those actions are not sanctioned by God. Howe'er you come to know it, answer me. What’s this, you secret, evil hags of midnight! What are you doing? I charge you in the name of whatever gives you your powers to answer me, however you know the answer. Even if you let loose harsh winds to batter churches, even if you smash ships and sink them with storms. Even if you beat down cornfields and trees, even if you let castles topple on the heads of those guarding them. Even if palaces and pyramids collapse, even if all the seeds in nature get mixed together, even if you make destruction itself sick, answer what I ask you! Using weather imagery, Macbeth demands that the witches use all their supernatural powers to answer his questions, even at the costs of a horrible storm: waves swallowing ships, winds blowing down palaces and pyramids, and gales destroying crops and preventing future harvests by tumbling down the “treasure”, or treasury building used for storing the seeds for next year’s crops. Would you rather hear it from us, or hear it from our masters? Call them. Let me see them. Pour in the blood of a sow that ate her nine piglets, and throw the grease from a hanged murderer into the flame. Thyself and office deftly show. Come, spirits great or small. Show yourselves and your purposes! He knows what you’re thinking. Listen to him, but don’t say a word. Beware the Lord of Fife. Let me depart, that’s enough. Beware the Thane of Fife. Dismiss me, enough. Whatever thou art, for thy good caution, thanks. You can’t give him orders. Here's another, more powerful than the first. If I had three ears, I would hear you. Be bloody, bold and decisive. 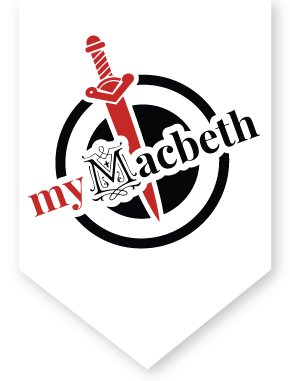 You can be scornful of any man’s power, for no one who was born from a woman can ever hurt you, Macbeth. Go ahead and live, Macduff! Why should I be afraid of you? But, just as a double guarantee, I’ll kill you anyway. That way I’ll prove my fears are groundless, and I’ll be able to sleep soundly. Why what’s this? It looks like a king’s child, and it has a crown on its baby head! Listen, but don’t speak to it. Be as brave and proud as a lion; and don’t worry about the discontents and conspirators in your kingdom. You won’t be defeated until Birnam Wood itself comes up Dunsinane Hill to march on your castle. That’ll never happen! Who can command a forest, order trees to pull up roots and march? These are sweet promises! You rebellious dead spirits, you can’t rise until Birnam Wood rises. King Macbeth will live out his life, breathing until his time comes and he dies a natural death. But I must know one more thing. Tell me if you can: will Banquo’s descendants ever rule this kingdom? Unfix his earth-bound root? Sweet bodements, good. The ghost of Banquo is rebelling against King Macbeth. By rising from the grave, the ghost is rebelling against the natural state of death. I will have my questions answered! If you deny me this, I’ll curse you for eternity! Tell me! Why is the cauldron sinking into the ground? What’s that noise? Show him, and make his heart grieve. Come like phantoms, and disappear the same way. And an eternal curse fall on you. Let me know. Thou art too like the spirit of Banquo. Down! You look too much like Banquo’s ghost. Go away! Your crown burns my eyes. And your hair, as gold as the crown you wear, is just like the first one’s. A third one just like the others. You filthy hags! Why are you showing me this? A fourth! My eyes are coming out of their sockets! What, does this line of kings keep going on until doomsday? Another one. A seventh! I won’t watch any more. But now an eighth one appears, carrying a mirror in which I see many more. Many are carrying double orbs and triple scepters, indicating they will be king of both England and Scotland. What a horrible sight! Now I see it’s all true. That blood-spattered Banquo is smiling at me and indicating they are all his descendants. Why do you show me this? A fourth. Start, eyes. Another yet. A seventh. I'll see no more. That two-fold balls and treble scepters carry. "two-fold balls and treble scepters"
The images in the mirror represent more of Banquo’s descendants who will become kings of Scotland. Some are carrying two ornamental balls and three ornamental staffs. This indicates that these kings will rule not only Scotland (whose regal ornaments consist of one ball and one staff), but also England (one ball and two staffs). This is a reference to Shakespeare’s new English king, James I. James had unexpectedly inherited the English crown after already serving as the Scottish monarch for 36 years. What? Can this be true? Yes, sir, it’s all true. But why is Macbeth standing there looking so shocked? Come, sisters, let’s cheer him up! Show him the best we have to offer. I'll put a spell on the air to make music, while you perform your fantastical dance. This way the King will kindly say that we did our duty and gave him a good welcome. Where are they? Gone? Let this horrible date be cursed forever in the calendar! You out there, come in! Did you see the witches? Didn’t they go past you? Let the air they fly through be infected, and damn everyone who trusts them! I heard a horse galloping; who was that? It was two or three men, my lord, who came to tell you that Macduff has fled to England. The galloping of horse; who was't came by? Time, thou anticipatest my dread exploits. [Aside] Time, you anticipate my every bloody move. Intentions are formed quickly, but are not carried out unless action occurs just as rapidly. From now on, the first thing in my mind will be the first thing I do. I’ll start now by crowning my thoughts with action – no sooner said than done. To crown my thoughts with acts — be it thought and done. I’ll go unexpectedly to Macduff’s castle and seize Fife, kill his wife and children, and anyone else unfortunate enough to be related to him. I won’t brag like an idiot. I’ll just do it before my resolve fades. But no more strange visions! – Where are these messengers? Bring me to them. But no more sights. — Where are these gentlemen?